Ever since Tony Yang (楊祐寧) ended his relationship with Amber Kuo (郭采潔) in 2015, his love life has seemingly been barren. 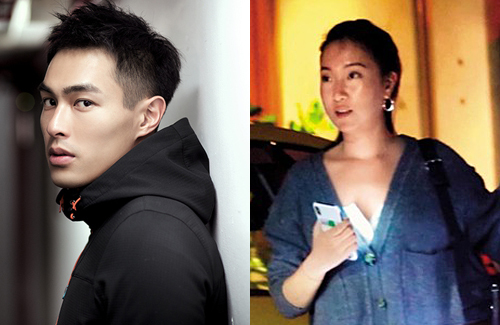 However, the truth is that the All is Well <都挺好> star has secretly been dating for the last two years! Two years ago, Tony participated in Mainland variety show Divas Hit the Road <花兒與少年> and Jing Boran (井柏然) was able to trick him into accidentally revealing that he had a girlfriend. He did not immediately deny at the time, but paparazzi has never been able to get concrete evidence of his girlfriend’s existence. On May 14, a woman with a long ponytail was witnessed entering an upscale Japanese restaurant with a middle-aged lady. When exiting the restaurant, paparazzi were able to confirm that the middle-aged woman was Tony’s mother and the lady in the ponytail was Tony’s rumored girlfriend, Melinda. The paparazzi also recognized that his girlfriend had previously dated singer Eric Chou (周興哲), who was six years her junior! The trio ordered an Uber car and after dropping off his mother, Melinda got off at a condo nearby. After 20 minutes or so, another Uber car arrived with Tony Yang in it. He stood at the entrance of the condo seemingly trying to remain inconspicuous before entering. It seems that their relationship has reached a stage of co-habitation.